Abstract: Background: Femoral shaft fractures are an important cause of mortality and morbidity in the lower extremity injuries.Methods: 21 femoral body fractures of 19 adult patients were treated with the unreamed intramedullary nailing. Of 19 patients 14 were males and 5 were females.Results: All fractures healed. Deep infection was not encountered. According to the Thoresen criteria, the rate of excellent-good results was 78%. In two patients, who had also cranial trauma, development of excessive callus was observed. None of the patients required a secondary operation. Conclusions: Unreamed intramedullary nailing, if it can be implemented with closed technique and with double lock screw at the distal side, provides satisfactory results in the femoral shaft fractures. Abstract: Background: Total knee replacement (TKR) is the most widely practised elective surgical procedure for advanced osteoarthritic patients globally. There is paucity of data on TKR’s in south Indian population. This study was aimed at analysing the peri-operative data of primary TKR’s to ease in customising the imported implants for our population.Methods: Data on 261 TKR’s performed in our institute over 40 months was collected. Categorical variables like age, gender, size of components used, co-morbidities and type of implants used were analysed.Results: Out of 220 patients with 261 knees, 141 were females (173 knees) and 79 were males (88 knees). The age group of the cohort was 60±11.2 years (Mean±SD). Diabetes and Hypertension (n=152) were the commonest co morbidities. The Cruciate Retaining (CR) type of prosthesis was used to the maximum extent (n=218). Size 3 femoral and tibial component was the commonly used in males and size 2 in females. 143(54.8%) knees had tibio-femoral component mismatch. Conclusions: This study gives a reasonable insight into various aspects of the total knee replacements in a South Indian Institute. This data would be useful for manufacturing suitable implants customised for our population in the context of imported implants being in vogue. It also helps the operating surgeon to appropriately order for the desirable implants well in advance lest he should struggle intra operatively for want of better clinical outcome. Abstract: Background: With the increase in high velocity trauma, the incidence of intra-articular fractures of distal end of radius, particularly in adults- the working class of society is increasing. Normal functioning of wrist is of paramount importance for all activities of daily living and working. 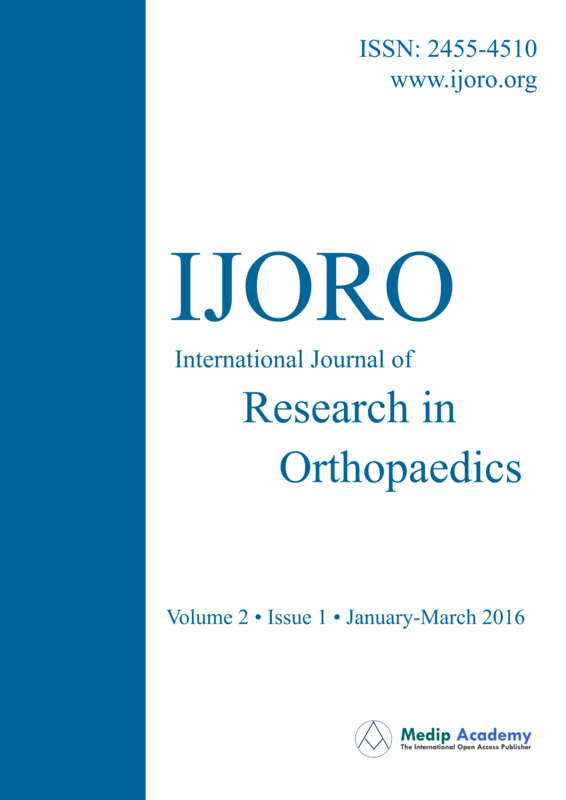 The present study was undertaken to evaluate the results of using volar locking plate for fixation of intra-articular fractures of distal end radius, with emphasis on return to pre-injury employment assessment.Methods: It is a combined prospective and retrospective study from January 2013 to June 2016. Twenty patients of intra-articular fractures of distal end of radius (AO type B2 and B3) were treated with volar locking plate through volar approach. The patients were regularly followed up for one year. The assessment of pain, range of motion, activity and grip strength were scored by Green and O’Brien’s system.Results: According to scoring system of Green and O’Brien the patients were assessed at 1 year follow up. 17 patients (85%) showed excellent results (scores 90-100). 2 patients (10%) showed good result (scores 80-89) while 1 patient (5%) had fair outcome (score 65-79). No patient had poor result (score less than 65). 19 patients (95%) returned to their pre-injury employment at 1 year.Conclusions: Open reduction and internal fixation with volar locking plate is reliable and excellent methods of management of intra-articular fracture of distal end of radius especially shear type of injury (AO type B2 and B3) in adults. Abstract: Background: This study was conducted to compare accuracy of MRI findings taking arthroscopy as standard in knee injuries.Methods: All patients attending our hospital with knee injury underwent clinical examination. Out of them 100 patients with knee injury were subjected to clinical examination, MRI and then Arthroscopy. The results were compared and analyzed using various statistical tests. The accuracy, sensitivity and specificity were calculated based on these arthroscopic and MRI findings.Results: The accuracy of clinical diagnosis in our study was 88% for ACL tears and 85% for meniscal tears. Our study proved high sensitivity and specificity and almost high accuracy for ACL injuries of knee joint in comparison to arthroscopy. MRI is an excellent screening tool for therapeutic arthroscopy. We can avoid diagnostic arthroscopy in patients with knee injuries having equivocal clinical and MRI examination and go on for therapeutic modality. Conclusions: For the assessment of ligamentous and meniscal injuries magnetic resonance imaging (MRI) is accurate and noninvasive modality. It can be used as a first line investigation but arthroscopy still remains gold standard in diagnosing ACL and meniscal injuries. Abstract: Background: The objective of the study was to assess the outcome of vascularised muscle pedicle bone graft for scaphoid non-union.Methods: 14 men and 6 women aged 18-45 (mean 25) years with non-union of scaphoid involving proximal pole (n=4), waist (n=14), distal pole (n=2) were randomized to undergo vascularised muscle pedicle bone graft with Herbert screw fixation. The mean duration of non-union was 10 months (range 4-14 months).Results: The mean follow up duration was 24 months. 17 of 20 achieved union. 12 of 20 achieved correction of both scapholunate and radiolunate angle. 5 of 20 did not achieve full correction of sacpholunate and radiolunate angle. 3 of 20 did not achieve union. 2 of these 3 were associated with proximal pole absorption. There was no hardware failure or any iatrogenic fracture during pedicle dissection. Conclusions: The use of vascularised bone graft has proved to be an effective method for treating scaphoid non-union, especially non-union with an avascular proximal pole and those that have failed to heal after previous procedure. Abstract: Background: Distal femur fractures need to be treated operatively to achieve optimal outcomes. Different types of internal fixation devices have been used but, the number of revisions for non-union, loss of reduction and implant failure has been high.Methods: This prospective study reviewed 20 cases of distal femoral fractures surgically managed with distal femoral locking compression plate between December 2013 and December 2015 at Mediciti Institute of medical sciences, Ghanpur, Medchal, tertiary care referral and trauma centre. Fractures were categorized according to OTA classification by Muller.Results: Highest number of patients was in their 3rd decade (25%) 18 out of 20 patients had closed injury. Type A2 Muller’s fracture was the most common fracture type 7 out of 20 patients (35%).The mean follow up period in this study was 8 months. The average range of knee flexion achieved was about 109°. The mean score 81.75 points were rated using Neer’s functional score (Max 100). Conclusions: The locking compression plate is the treatment of choice in the management of comminuted distal femoral fractures especially Type A fractures where we have found higher Neer scores. It may not completely solve the age-old problems associated with any fracture like non-union and malunion, but is valuable in the management of these fractures. Abstract: Background: Spastic cerebral palsy (CP) remains the most common type of CP and may be managed surgically or non-surgically depending upon its severity. Recent advances have replaced single-level surgery by the concept of multilevel surgery where multiple levels of musculoskeletal pathology, in one/both lower limbs, are addressed during one operative procedure, requiring only one hospital admission and one period of rehabilitation. This study assessed the outcome of lower limb soft tissue surgery in children with spastic CP in a government rehabilitation unit and measured its feasibility with limited infrastructure facilities and patient compliance.Methods: The study comprised of 26 patients aged between 2-12 years. Physical examination and GMFCS scores were recorded and evaluation of sitting balance, standing balance and gait were done. Musculotendinous soft tissue lower limb surgery was performed at one or more levels unilaterally or bilaterally and the results were interpreted.Results: Complete or near complete correction of deformities were attained by all children postoperatively. Significant improvements were noted in the gross motor functional classification system (GMFCS) scores. All parents and children were satisfied with the surgical outcome and reported improvement in functional abilities and locomotion in the follow-up along with better quality of life and mobility. Conclusions: Lower limb soft tissue surgery is a valuable aid in improving functional abilities and locomotion in children with spastic CP. Surgery should be undertaken depending upon clinical indications and can be successfully carried out in government hospitals with ordinary infrastructure in developing countries as well. Abstract: Background: With increase participation in sports activities, anterior cruciate ligament (ACL) tear is a common and functionally disabling injury. Hamstring tendon as autografts for arthroscopic ACL reconstructions have shown good clinical and functional outcome in patients. The purpose of present study was to compare the functional outcome of arthroscopic Anterior Cruciate ligament (ACL) reconstruction using single bundle six fold and four fold ST and G graft.Methods: This was a prospective study conducted between period June 2008 to December 2010.181 patients undergoing ACL reconstruction were screened and 113 patients fulfilling the inclusion exclusion criteria were selected for the study.Results: All patients completed a minimum of 1 years follow up. In 4 fold group 27.50% were having grade 1 anterior drawer test 22.50% were having grade 1 Lachman test and 17.50% had grade 1 pivot shift test as compared to 6 fold group 6.66% had grade 1 anterior drawer test, 11.66% had grade 1 Lachman test, and 3.33% had grade 1 pivot shift test respectively which was statistically significant (p<0.05). Conclusions: Arthroscopic ACL reconstruction using six fold graft is effective modality of treatment in patient with ACL deficient knee. Six fold graft is thicker in diameter and cross sectional area as compared to four fold graft which occupies more surface area of normal ACL foot print and gives better stability of knee joint in both AP and rotational plane. Abstract: Background: Different surgical procedures have been used for treatment of chronic ruptures of the Achilles tendon with varying results. This study assesses the functional outcomes and complications of chronic insertional tears of Achilles tendon.Methods: 10 patients with chronic ruptures of the Achilles tendon were followed for a mean period of 10.3 months. Only ruptures at or near (within 1 cm) insertion were included. They were treated by direct repair of tendon to calcaneum by suture anchor. Flexor hallucis longus (FHL) tendon transfer fixed to calcaneal tunnel with an interference screw was used to augment the repair.Results: Outcome was assessed by AOFAS Ankle-Hindfoot (AHS) score. The mean preoperative score of 41.2 improved to 85.4 at final follow-up out of a total 100 points. We achieved excellent results in 80% and good outcome in 20% cases. No re-ruptures were noted. Conclusions: In insertional chronic ruptures of Achilles tendon, FHL transfer to calcaneum with interference screw fixation and repair of Achilles tendon with suture anchor is a reliable technique with good outcome and is recommended. Abstract: Background: There is a considerable amount of literature on calcaneal fractures and their treatment; however the best management approach has yet to be determined. The results of ORIF and conservative treatment have been described and compared in several studies.These studies show improved outcome after operative management.Methods: This is a study of 30 patients with ages ranged from 18 to 65 years with displaced intraarticular fractures of the calcaneus treated by open reduction and internal fixation. 4 patients had bilateral fractures. Out of 34 fractures in 30 patients, 22 fracture calcaneum were joint depression type and 12 fractures were tongue type.Results: In 17 cases normal Bohler angle (i. e. 200-400) was achieved. There were 3 cases of post operative delayed wound healing, 2 cases of superficial wound infection and 1 case of sural nerve complication in the form of loss of sensation on lateral aspect of foot. According to American Orthopaedic Foot And Ankle Society (AOFAS) score, 13.33% of the patients had excellent results, 63.33% had good results, 13.33% had fair result and 10% had poor results. Conclusions: Operative fixation of displaced intra-articular fractures of the calcaneus by reconstruction locking plate, restores the calcaneal height, allows early mobilization and weight-bearing, and maximizes the chances for good joint function. Abstract: Background: Congenital idiopathic clubfoot is a complex foot deformity often requires many months of treatment and frequently resulted in incomplete or defective correction by older methods. Deformity can be corrected with serial manipulation and casting with minimal or no surgery as reported by Ponseti. This study is an attempt to evaluate the effectiveness of Ponseti technique in treatment of idiopathic congenital talipes equino varus.Methods: 30 patients between age group of 01 to 24 weeks with 48 feet having congenital idiopathic clubfoot were treated using Ponseti technique. The guidelines for treatment were followed as per the Ponseti method of serial manipulation and casting at weekly intervals.Results: 43 (89.58%) cases were treated successfully by using Ponseti technique without need of extensive surgery. 42 feet required tenotomy. 38 (79.16%) feet had an excellent outcome, 5 (10.42%) feet had a fair outcome and 05 feet (10.42%) had poor outcome as measured by the Pirani scoring system. 7 (14.58%) patients had cast related complications.Conclusions: The Ponseti method is a safe, effective and reproducible method for correction of idiopathic congenital talipes equinovarus which significantly reduces the rate of extensive corrective surgeries for correction of clubfoot. Abstract: Background: Fractures of the forearm bones are very common. The most common form of stabilization is plate and screw fixation. The role of Intramedullary nailing of fractures of the shafts of the adult radius and ulna is still to be defined. This study was perform to analyze anatomical and function outcome of the patients treated by Talwarkar square nail.Methods: We evaluated 46 patients (29 males and 17 females) had fracture both bone forearm treated by intramedullary nail. We analyzed patients in two broad group one with close fracture or grade I, II open fracture (34 patients) and other have open fracture grade IIIA or IIIB (12 patients). First group patients further analyzed weather close (22 patients) or open reduction (8 patients) required. Functional outcome was calculated by Grace and Eversman system.Results: Out of 32 patients of close fracture or open grade 1 or 2 fracture, 29 (90.62%) have excellent or acceptable result. All the patients (100%) in whom close reduction succeeds achieved excellent result. 22 (64.70%) patients close nailing possible.12 patients in whom open reduction required 9 (75%) goes into union. Close nailing have overall success rate is 90.62% where it fail and open nailing require success rate bring down to 75%.. Conclusions: IM nailing gives satisfactory results. Advantages of close nailing are- early union, low incidence of infection, small scars, less blood loss, short operating time with minimal surgical trauma, easier implant removal. Even though plate and screw fixation is the gold standard for stabilization of both bone forearm fracture but intramedullay implant can be used in selected cases with good result. To achieve acceptable result – early surgery, proper selection of the case, pre-operative planning, proper assessment of diameter, length and radial bowing of the nail, is required. Abstract: Background: The management of displaced intra-articular calcaneal fractures (DIACFs) remains challenging and controversial. A prospective study to assess the functional outcome of patients with displaced intra-articular calcaneal fractures treated with percutaneous reduction, cannulated screw fixation.Methods: Ultimately, 14 patients with a DIACFs, underwent. percutaneous reduction, cannulated screw fixation. Functional outcomes were evaluated using the American Orthopaedic Foot and Ankle Society (AOFAS) hind foot scores. Radiological results were assessed using plain radiographs and computed tomography (CT) scans, and postoperative wound-related complications were also recorded.Results: A total of 46 adult patients were assessed in our study. Twenty patients did not meet the inclusion criteria and were excluded. Twelve patients were excluded due to severe medical ailments (2 patients) and non-adherence to the treatment plan (10 patients). Therefore, 14 patients with an average age of 42.5 years old (range, 20 to 72 years) including 10 men and 4 women participated in the study. All patients were followed-up for 12 months averagely (range, 11 to 18 months). Complete articular reduction is achieved in 8 patients, 6 patients had articular depression of posterior facet, 3 patients had heel widening and lateral impingement. There was no wound complications in any of the patients, 2 patients developed sub talar arthritis at 2 years of follow up. Conclusions: Surgical treatment of intra articular calcaneal fractures remains challenging task. Minimally invasive reductions remain good option to minimize wound complications. Cannulated cancellous screw fixation is good option for intra articular calcaneal fracture. Abstract: Background: Valgus deformity presents a major challenge in total knee replacement, especially in moderate or severe cases. Many surgical techniques have been described to balance the soft tissues in correction of a severe valgus deformity during total knee replacement. The structures most commonlyreleased in a valgus knee include the posterolateralaspect of the capsule, iliotibial band (IT band), the lateral collateral ligament (LCL), the popliteustendon, and the lateral head of the gastrocnemius muscle.Methods: thirty two patients undergoing unilateral total knee replacement were followed for the evaluation of study. There were 22 female (68%) and 10 males (32%) with an age of 62.7±6.9 years (range 50-75) with valgus deformity of 18.59˚±8.32˚ (range 10-40˚). Preoperative diagnosis was rheumatoid arthritis in 23 patients (72%) and osteoarthritis in 9 patients (28%). Posterior stabilizing cemented implants were used.Results: Based on total knee score we achieved 21 (63.64%) excellent, 10 (31.82%) good and 1 (4%) fair results. With the total functional score we had 16 (50%) excellent, 15 (45.45%) good and 1 (4%) fair results. In patients with only step1 release (17 patients) we achieved 84% (15 pts) excellent, 8% (1 pt) good, 8% (1 pt) fair with knee score; and 67% (11pts) excellent, 33% (6pts) good with functional score. In step 2 release group (15 pt) we achieved 10% (1 pt) excellent, 90% (14 pts) good with knee score; and 10% (1pt) excellent, 80% (13 pts) good and 10% (1 pt) fair with functional score. Conclusions: Good to excellent results can be achieved with two step sequential lateral release of posterolateral capsule and IT band pie-crusting which has direct correlation with severity of valgus deformity. The safety, simplicity, and high success rate of the two step sequential lateral release of posterolateral capsule and pie-crusting of IT band justify its routine use to correct every valgus deformity in total knee replacement. Abstract: Background: Tibial plateau fractures affect knee which is a major weight bearing joint, altering its contribution to stability and its function. Regardless of the advancements in technique and implants, ideal mode of management is still contentious.Methods: This prospective study reviewed 20 consecutive cases of tibial plateau fractures managed surgically by various modes of internal fixation from November 2012 to June 2014 in the Department of orthopaedics at Mediciti Institute of medical sciences, Ghanpur, Medchal, a tertiary care referral and trauma center.Results: This study comprised higher number of fractures type II and type IV Schatzker classification, with mean age of 37.75 years. Most frequent mode of injury is Road traffic accident in n=17 out of n=20 patients (85%). Mean gain in flexion of 113.33 degree. Mean score of 27.15 and 9.70 under modified Rasmussen criteria for clinical assessment and radiological assessment respectively at 6 months. Conclusions: Optimal outcome from surgical care of tibial plateau fracture is acquired when precise articular surface reconstruction with elevation of depressed bone fragment, and bone grafting when necessary, associated with rigid fixation which permits early physiotherapy and return to function. Deficiency of excellent results among type V and type VI fractures are often secondary to inadequate reconstruction and collapse of articular restoration post operatively. Abstract: Background: It is important to study the cause of tunnel widening which occurs after anterior cruciate ligament (ACL) reconstruction as it may affect tendon to bone healing. Amount of tunnel enlargement that happens after different fixation methods like interference screw or suture discs needs to be compared.The objective of the study was to test the hypothesis that aperture fixation (interference screw) reduces tunnel enlargement compared to suspensory fixation (suture disc) due to reduced graft tunnel motion.Methods: 24 bone tunnel diameters in 12 patients were evaluated by CT scan postoperatively after ACL reconstruction to measure tunnel widening. Two groups were formed, one consisting of 14 tunnels fixed by interference screws (IFS) and other consisting of 10 tunnels fixed with suture disc (SD). The difference between the two groups was compared by unpaired student’s t test.Results: The mean tunnel widening in IFS group was 0.414mm while that in the SD group was 1.23mm. The difference between the means of the two groups was statistically significant (p<0.001). Conclusions: Tunnel widening phenomenon was significantly less with anatomic IFS fixation as compared to suture disc fixation probably due to reduced motion of graft within the walls of bony tunnel and consequently better graft healing. Abstract: Background: Open fracture of tibia is a surgical crisis. This study aims to discover out the efficacy of negative pressure wound therapy in these fractures.Methods: Present study was performed at department of orthopedics, Gujarat Adani institute of medical science, Bhuj, Kutch, Gujarat. 35 patients with type III open Tibia fractures, managed with wound debridement and external fixation were divided in two groups of 17 and 18 as Group A and Group B.Results: The incidence of wound infection was fewer and wound coverage was enhanced in Group A (p≤0.05) when compared to Group B. Wound healed before and hospital reside was not as much of in Group A (p>0.05). Conclusions: Early on management with debridement after VAC (vacuum assisted closure) therapy has abridged wound infection rate and instance for soft tissue coverage in patients with open fracture tibia. Abstract: Background: Dislocation of carpo-metacarpal (CMC) joints especially involving the 2nd and 3rd or paired dislocations, presents a rare pattern of orthopaedics hand injuries. They are associated with high energy trauma usually involving motorbike accidents. Severe soft tissue inflammation over the affected hand and associated injuries often makes detection of these fractures difficult. They require prompt management at presentation. Failure to be diagnosed and treated at early stage leads to joint stiffness, restrictions of wrist movement, deformity and sometimes ruptures of tendons crossing the wrist. Most of them require open reduction and internal fixation for stabilization. The objective of the study was to clinically evaluate outcomes in management of carpometacarpal joint dislocations.Methods: We prospectively studied 6 cases of CMC dislocation presenting at average of 1week from the original injury. All were clinically and radiologically evaluated. 3 cases were managed with open reduction and internal fixation with K wire and 1with closed manipulation and percutaneous k wire fixation and 1 case by arthrodesis of CMC joint. Functional assessment was done with Quick DASH score at 6 weeks, 3 months, 6 months and 1 year.Results: All the patients went on to have good functional recovery. The average quick DASH score showed improvement from 77.39 to 4.07 over 1 year follow-up. Conclusions: Careful and meticulous examinations of hands are necessary in high velocity trauma cases to avoid missing diagnosis of CMC dislocation. ORIF remains the gold standard treatment which can also be used for cases presenting late, followed by aggressive post-op physiotherapy can lead to excellent recovery of hand function. Abstract: Background: Intertrochanteric fracture is one of the common fractures of the hip in the elderly over the age of 50 years. Dynamic hip screw is still considered the gold standard for treating intertrochantric fractures by many. Not many studies compare the DHS with proximal femoral nail (PFN).Methods: This prospective study included 32 patients of intertrochanteric fractures in which 16 patients were treated by PFN and rest 16 by DHS. All patients were operated under image intensifier control. Average age of the patients was 65 years (20-80) years.Results: In our series the patients with DHS has increased intra operative blood loss (160 ml), longer duration of surgery (54.6 min) and required longer time for mobilization (15 weeks) while patients who underwent PFN had lower intra op blood loss (95 ml), shorter duration of surgery (41.2 min). The Salvati and Wilson hip scoring is better in PFN group. Conclusions: PFN produces better results than DHS in terms of shorter duration of surgery, early weight bearing, lower infection rate and less blood loss. Abstract: Background: The mini-open repair is considered to be the gold standard for rotator cuff repair. This study was aimed to assess functional outcome of mini-open rotator cuff repair of shoulder joint in adult patients.Methods: This was a one year hospital based prospective study conducted from January 2016 to December 2016. A total of 20 patients diagnosed to have rotator cuff tear of shoulder joint undergoing rotator cuff repair in the department of Orthopaedics, KLES Dr. Prabhakar Kore Hospital and Medical Research Centre, and KLES Dr. Prabhakar Kore Charitable Hospital, Belagavi were studied.Results: Majority of the patients (85%) of the patients was male and male to female ratio was 5.6:1. Most of the patients were aged between 31 to 40 years (30%). The mean age was 41.90±13.98 years. Most of patients had degenerative rotator cuff tear (45%) and (70%) presented with features of swelling. At enrollment all the patients (100%) had poor constant score (>30) and fair/poor UCLA score (<27) suggestive of severe pain functional restriction. There were gradual but steady increase in scores from enrollment to each follow up till six month follow up with respect to mean flexion (6.25±5.35 to 163.50±7.63),abduction (5.50±5.10 to 112.0±5.94),external rotation (3.00±4.7 to 82.50±2.56 ),internal rotation (2.50±4.44 to 67.25±3.43 ) and UCLA score (5.35±1.63 to 29.60±0.82 ) (p<0.001) also there was gradual but steady decrease in mean VAS score from enrolment (7.70±0.47 ) to six months follow up (0.00±0.00) and constant score ( from 85.70±1.98 to 7.85±1.46 respectively) (p<0.001). The constant score and UCLA score at six month follow up revealed excellent functional outcome. Conclusions: The mini-open rotator cuff repair of shoulder joint results in excellent functional outcome among adult patients with rotator cuff tear of shoulder joint especially after six month with no complications and complete pain relief. Abstract: Background: Various modalities of treatment are available for the management of delayed and nonunion of long bone fractures. The aim of this study was to evaluate the role of percutaneous autologous bone marrow injection in the management of these fractures and to compare the results with studies of other authors as available in literature.Methods: 15 patients with delayed and nonunion of long bone fractures were studied between January 2013 to January 2015 and were followed up for a period of 1 year. The patients were clinically and radiologically evaluated at regular time intervals at follow up.Results: The age of the patients ranged from 28 to 60 years with the mean age being 44.2 years. There was a male preponderance in our study with the male to female ratio being 2:1. The left side was more commonly affected as compared to the right. The mean time to radiological appearance of callus was 6.4 weeks. The mean time to clinical union was 7.33 weeks while the mean time to radiologic union was 13.4 weeks. We had a union rate of 93.3% in our series with one fracture going in for failure of union. Conclusions: Percutaneous autologous bone marrow injection is a minimally invasive, safe and cost effective option in the management of delayed and nonunion of long bone fractures and gives good functional results. Authors: Madhuchandra P., Raju K. P., Pawankumar K. M., Shrinidhi I. S.
Abstract: Background: Idiopathic congenital talipes equinovarus is a characterized by deformities with lot of ambiguity regarding the forces maintaining the deformity and preventing its correction. The aim of our midterm study is to analyze the functional outcome of idiopathic congenital talipes equinovarus using Ponseti’s technique in Indian children presenting to us within the first three months of life without any prior treatment.Methods: 87 patients with 132 feet were treated for correction of idiopathic congenital talipes equino varus using the Ponseti technique from September 2009 to January 2013 at our Institute. These patients were followed up in a prospective manner for a period ranging from twelve months to fifty seven months (mean period of follow up was thirty two months). Children were evaluated before casting and at the end of casting, then at monthly intervals for another two months. Further follow up was done every six weeks till three years of age and then at six monthly intervals.Results: Our overall good to fair result was seen in 87.6% of cases. Rest of them had poor functional outcome. Long term follow up of all patients till skeletal maturity is required to know the final outcome of our treatment. Conclusions: Severity of the deformity and the compliance of the parents and infants with orthotic devices for maintenance of the correction were the factors which ultimately determine the final outcome. Abstract: Background: Treatment of Achilles tendon rupture in young active patient remains controversial. Open primary repair remains the mainstay of treatment with prolonged rehabilitation and high wound complication rate (20%). In compound injuries it becomes the default treatment. Newer techniques are being tried to decrease re-rupture rate, decrease local complications and facilitate early rehabilitation. Modified gift box technique of open repair, which has shown higher strength of repair in in-vitro studies and good clinical results in the hands of its inventor. The aim of our study was to evaluate the clinical results of this technique in young active patients with compound Achilles tendon injury.Methods: This is a retrospective study. The parameters recorded at follow up included general demography, ability to single toe raise (on neutral, incline, decline), toe walking for 40 feet, and pain on VAS scale. Achilles tendon total rupture score and modified Rupp score were administered.Results: Out of the 8 patients included in the study, 7 patients had unilateral tear and 1 patient had bilateral tear. The mean age was 27 yrs (20-35) and mean duration of follow up was 17.4 months (08-24 months). Single toe raise and toe walking for 40 ft. was possible in all patients. Two patients complained of grade 2 pain on VAS Scale. The ATRS score was 97.1 (94-99) and modified Rupp score was 28.3 (26-29). Conclusions: Modified gift box technique gives excellent results in young active patients with compound Achilles tendon injury with no re-rupture and return of pre-injury activity. Abstract: Background: Tranexamic acid (TXA) has been shown to be effective in reducing blood loss during trauma and surgeries. Although there is no well-established protocol, it is now increasingly being used in joint replacement surgeries. The present study was designed to study the effect of intravenously given tranexamic acid during primary total knee replacement in reducing intraoperative blood loss and need for blood transfusion requirement, compared to a placebo.Methods: This study was designed as a parallel arm, double blind trial. 100 patients of primary osteoarthritis undergoing total knee arthroplasty under tourniquet was included in the study. The efficacy of a single preoperative bolus of TXA in the dose of 15 mg/kg on perioperative blood losses was studied against a placebo with objectives to compare the pre- and 24-hours post-operative level of haemoglobin (Hb) and haematocrit (Hct) levels and assess total volume of blood loss till 24-hours postoperatively and need for blood transfusion.Results: Out of 168 patients, who underwent TKA in our centre during the period of the study, 100 were included in the study, 50 patients were included in placebo group and 50 patients were included in TXA group. There was a statistically significant reduction in the use of transfusion (Fisher exact test; P=0.001). A total of 46 units of blood were used; 42 units transfused to participants in the placebo group and only 4 units transfused to participants in the TXA group. Conclusions: Intravenous TXA in primary arthroplasty leads to a statistically significant reduction in total blood loss and requirement for allogeneic blood transfusion with no apparent increased risk of thrombo-embolic complications. Abstract: Background: Calcaneum is usually fractured following high energy axial traumas such is seen in cases of fall from height or road traffic accidents. If not properly managed these fractures can be a cause of prolonged morbidity in the form of pain, stiffness and deformities. We have conducted this prospective study of fracture calcaneum with the method described by Allan et al which constitute of open reduction and bone grafting without any implants. The objective of the was to determine the clinical approach, described by Allan et al for treatment of fracture calcaneum and to discuss in short the results, pitfalls and challenges associated with this.Methods: A prospective study was done on 42 patients who were diagnosed with intra-articular calcaneal fractures depending upon a predefined inclusion and exclusion criteria. All fractures of the study subjects were treated using a lateral approach by Allan’s procedure. Final outcome was assessed on the basis modified Rowe score.Results: In this study a total of 42 patients with intra-articular calcaneal fractures and treated by open reduction and bone grafting without any implants were studied. There were 36 men and 6 women. Majority of the patients tolerated the procedure well and most of the patients (95.23%) had a complete or partial restoration of heel shape. Significant residual pain was seen in only 1 (2.38 %) patient. 36 patients (85.71 %) had excellent outcome 5 patients (11.90%) had good and 1 patient (2.38%) had satisfactory outcome. Conclusions: The management of intra-articular calcaneal fracture by open reduction and bone grafting without any implants give good results with excellent functional outcome. Since no implants are used in this technique this can be a preferable procedure in rural areas and in patients with low socioeconomic status. Abstract: The case series illustrates the correction of bony deformities of the tibia through a percutaneous osteotomy and gradual distraction with the Ilizarov apparatus in order to restore shape and function of the lower limb. A total of 13 cases of tibial deformity which were gradually corrected by the Ilizarov method were included in the study. The plane and degree of deformity was calculated by Drorr Paley’s method. The tibial deformity was gradually corrected in all patients by the Ilizarov method. Hinges were appropriately placed usually at the level of deformity (CORA). In most of the cases percutaneous osteotomy was done at the level of CORA. In juxta-articular deformities, hinges were placed at the level of CORA but the osteotomy was done at different levels. The mean tibial varus in 12 patients was 24 degrees (range of 18 to 34 degrees) and one patient had a tibial valgus of 22 degrees which was corrected to restore a 90 degree medial proximal tibial angle. No healing problems in the regenerate except for one probable hypertrophic non-union. None of the patients with a tibial varus developed any neurological deficit or compartment syndrome following correction. Abstract: We present a case of fracture intra capsular neck of femur in a young adult osteopenic patient, who had a nonunion and early signs of avascular necrosis even after the initial surgical intervention. Teriparatide was administered for two monthly doses after diagnosis of nonunion and avascular necrosis of femoral neck. 90% successful union was achieved in 2 months without further surgical intervention, and no adverse events related to the use of teriparatide were observed. Our case report shows that teriparatide can be an alternative to surgical intervention in nonunion of ICNF with early signs of avascular necrosis. Abstract: Posterior dislocation is a common injury but it’s occurrence in association with anterior column fracture is very rare. We report a case of this rare injury pattern. The patient was treated with closed reduction of dislocation followed by open reduction internal fixation of anterior column. Abstract: Patients with developmental dysplasia of hip eventually lead on to secondary osteoarthritis in adulthood and may end up with total hip arthroplasty at a younger age. Because of the altered anatomy of dysplastic hips, total hip arthroplasty in these patients is a technically demanding procedure. Altered anatomy of the acetabulum and proximal femur together with leg length discrepancy pose challenges during total hip arthroplasty. Since the majority of the patients are in the younger age group, soft tissue balance is of great importance to maximise postoperative functional result and longevity of prosthesis. In this paper, we present a series of our patients with a spectrum of disease manifestation from mild to severe form and also discuss the associated challenges and the technical solutions and their outcome. Abstract: Nonunion of diaphyseal fractures of the humerus are frequently seen in clinical practice (incidence of up to 15% in certain studies) and osteosynthesis using dynamic compression plates, intra medullary nails and Ilizarov fixators have been reported previously. Locking compression plates (LCP) are useful in the presence of disuse osteoporosis, segmental bone loss and cortical defects that preclude strong fixation. Fixation using a compression plate and a non-vascularised fibular graft achieves good outcome for infected non-union of the humerus despite prior multiple failed surgeries. We report a failed case of fracture shaft humerus which was operated three times, first with DCP and next two times with DCP and autologous cancellous bone graft from iliac crest. The patient is now treated with LCP and on lay fibular bone grafting.